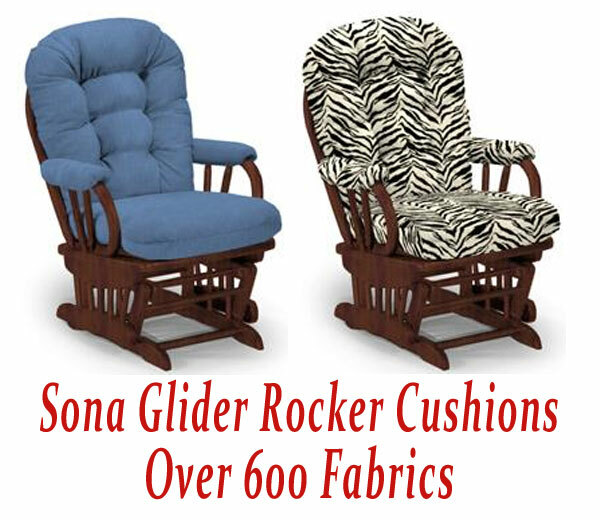 This glider rocker cushion set is a replacement set for the Best Brand Sona Glider Rocker Chair #C4130 and #C4137. If your glider rocker looks like the chair we have pictured but is not a Best brand chair exactly as above, or you are not sure of the brand do not purchase this cushion set as it may not fit. If you have a Best brand chair, turn the chair up side down and a paper tag should be visible at the bottom of the seat detailing the brand of chair and item number. Please order the correct cushion set. Comes as a set of 2 cushions, back and seat and also includes the arm rest pads. Excellent Company! Excellent Product! High Quality Material! High Quality Workmanship! Unbelievable Selection! Excellent Fit! and Expeditious Arrival!!! Best choice ever. Great service. Looks wonderful. We are very happy with our purchase. Thank you. The chair pads are very nice. The order was filled promptly.